Clare has a distinguished record in encouraging and nurturing post-graduate study. Currently, we have around 300 graduate students and they form a vibrant and vital part of the College community. Our commitment to post-graduate education is underpinned by our ability to offer financial support and subsidised accommodation. Along with our excellent academic reputation, these are the things that will encourage talented graduates to choose Clare. 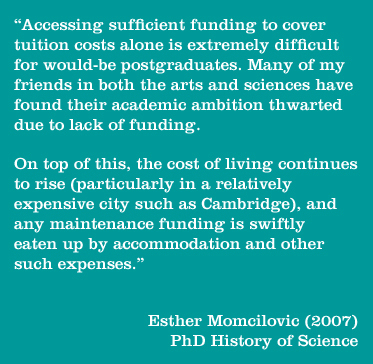 In recent years, severe cuts to the number and value of Research Council grants have made it even more challenging for graduates (particularly those from the UK) to fund further study. The reduction of Research Council grants has put much demand on College funds, which are already stretched, and threatens Clare’s ethos of equal, meritocratic access to education. Tony made an enormous contribution to Clare during his eleven years as Master (2003-14), both in terms of pioneering our award-winning access and outreach programme and ensuring the College remained an academically stimulating, forward-thinking environment. Government funding for postgraduate study has been cut in recent years, particularly in the arts and humanities. As Master, Tony was passionate about bringing the brightest and best students to Clare, regardless of background or family finances. As an academic he is a leading scholar of American History, specialising in post-World War II Southern political history. With this in mind, we aim to fully endow a postgraduate studentship in American History as a tribute to Tony’s outstanding contribution to Clare and its students. We have successfully raised more than half of the £500,000 needed to endow this studentship since the campaign was launched in 2014, and hope to welcome the first 'Tony Badger Postgraduate' to Clare very soon! We thank all those who have supported this project so far, and all further donations will be very gratefully received. "No career could have highlighted more the good fortune of this College in having senior academics of international distinction whose commitment to research in no way compromised their commitment to graduate and undergraduate teaching. Philip was a role model for collegiality and good citizenship in both the College and University. He exemplified the values that the College needs to sustain in the face of challenges ahead." £500,000 is required to fully endow this memorial studentship, and once again provide the much needed funding to bring the brightest postgraduates to Clare. Enabling this studentship to become fully endowed would be a wonderful tribute to Philip, who gave so much to benefit the teaching of MML at Clare. If you decide to support studentships for Clare's graduates, you may wish to direct your gift to one of our priority projects, mentioned above. Alternatively, you could choose to support one of our exisiting studentship funds. You may wish to establish a new studentship, in the name of your choice, for the benefit of a student in your chosen subject area and/or from a specific region or country.To find out more, please contact the Development Office.